Arch of the pont Notre-Dame. 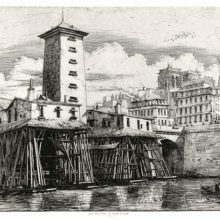 The Seine is seen through the arch of bridge, opening to a view including the Pont-au-Change, the supporting structure of the Notre-Dame water pump, and the roofs of the Palais de Justice. Small boats can be seen on the water as a man climbs down a knotted rope hanging down the side of the bridge. 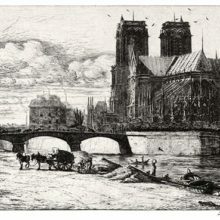 The caption reads in the original French: L’arche du pont Notre-Dame.